When there is an occlusion of the anterior spinal artery the clinical features appear which are characterized with the type of alternating hemiplegia i.e. medial medullary syndrome. This occlusion in the anterior spinal artery may lead to the infarction of medial part of medulla oblongata and this is known as medial medullary syndrome. The medial medullary syndrome have many other names like inferior alternating syndrome, hypoglossal alternating hemiplegia, lower alternating hemiplegia and dejerine syndrome. The infarction may occur on either side of the medulla oblongata. In this condition, the tongue will twist to the side of infarction. The limbs will become weak on the contralateral side of the infarction. The patient may not be able to feel the sense of touch and vibrations on the contralateral side of the infarction. The patient may not be able to perform some voluntary functions on the contralateral side of infarction. Syndrome is considered as alternating because the symptoms it is showing may occur contra laterally and ipsilaterally. Main cause reported behind medial medullary syndrome is the infarction of the medial part of medulla oblongata. Which may be treat by the medications to heal up the infarction occurred in medulla oblongata. The symptoms associated with this syndrome are as follows. The infarction may occur on either side of the medulla oblongata. In this condition, the tongue will twist to the side of infarction. The limbs will become weak on the contralateral side of the infarction. The patient may not be able to feel the sense of touch and vibrations on the contralateral side of the infarction. The patient may not be able to perform some voluntary functions on the contralateral side of infarction. The syndrome is considered as alternating because the symptoms it is showing may occur contra laterally and ipsilaterally. The main cause reported behind medial medullary syndrome is the infarction of the medial part of medulla oblongata. The infarction may occur due to the occlusion in the anterior spinal artery which may lead to the death of ipsilateral medullary pyramid nerve fibers along with medial lemniscuses and hypoglossal nerve fibers which pass through the medulla oblongata. 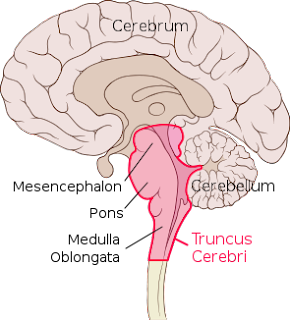 Only a part named spinothalamic do not get damage because of its location as it is located in the brain stem more laterally and the anterior spinal nerve do not supply blood over there. As the medial medullary syndrome occurs due to the infarction in brain specified area i.e. medulla oblongata. The antibiotics are prescribed to dilate the vessels and to provide appropriate oxygen supply. The drugs used in paralysis are prescribed to the patient with medial medullary syndrome. The patient along with medications, have to go through some exercises which should be performed under the supervision of a well trained physical therapist. Exercises are required to regulate the blood flow in the limbs which become weak. The surgery cannot be performed because the infarction is deep down in the brain.